Manchester, N.H. - Starting on Valentine's Day -- Thursday, February 14 -- fans can get their tickets to see the Eastern League Champion New Hampshire Fisher Cats (Blue Jays Double-A affiliate) back in action at Northeast Delta Dental Stadium. Individual tickets for all 70 home games will be available at nhfishercats.com beginning at 12:01 a.m. Fans can purchase tickets over the phone at (603) 641-2005 or in person at One Line Drive in Manchester when the Fisher Cats Box Office opens at 9 a.m.
"There's a lot to love about what's coming in 2019," said President Mike Ramshaw. "With new giveaways, special events, and major stadium enhancements, we've got so many exciting things to share with our fans this year. Opening Night can't come soon enough." The Fisher Cats will open the 2019 season on Thursday, April 4 at Northeast Delta Dental Stadium against the Binghamton Rumble Ponies (New York Mets). Opening Night features a Magnet Schedule Giveaway and a spectacular Atlas Fireworks show. The 2018 Fisher Cats rode a 6-0 playoff run to an Eastern League Championship, the third in franchise history. On Saturday, the Toronto Blue Jays invited 10 members of the team to Major League Spring Training, including Vladimir Guerrero Jr., Bo Bichette and Cavan Biggio. In 2019, New Hampshire will look to become the first team to win back-to-back Eastern League Titles since the Trenton Thunder (New York Yankees) in 2007-2008. 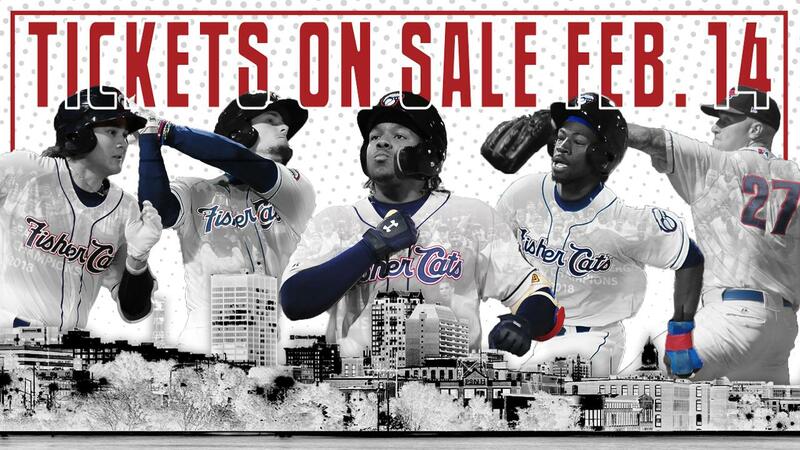 Fisher Cats Full and Half-Season Tickets and Mini-Ticket Plans are on sale now, and each ticket plan features a variety of benefits, gifts, and experiences. To learn more, stop by the box office at Northeast Delta Dental Stadium, call (603) 641-2005, or visit www.nhfishercats.com.